The sun follows the same path through the sky every day. Sun up. Noon. Sun down. The sun starts the day in the east in the morning, rises high in the sky at noon, and settles down again in the west for a nap at night. Here is an exercise to discover that path – the ecliptic. At noon, face south, put your hands together, point both hands at the sun, bend your arms slightly at the elbows. Keep your elbows high, and pull your hands toward your face until they are about 6″ away. 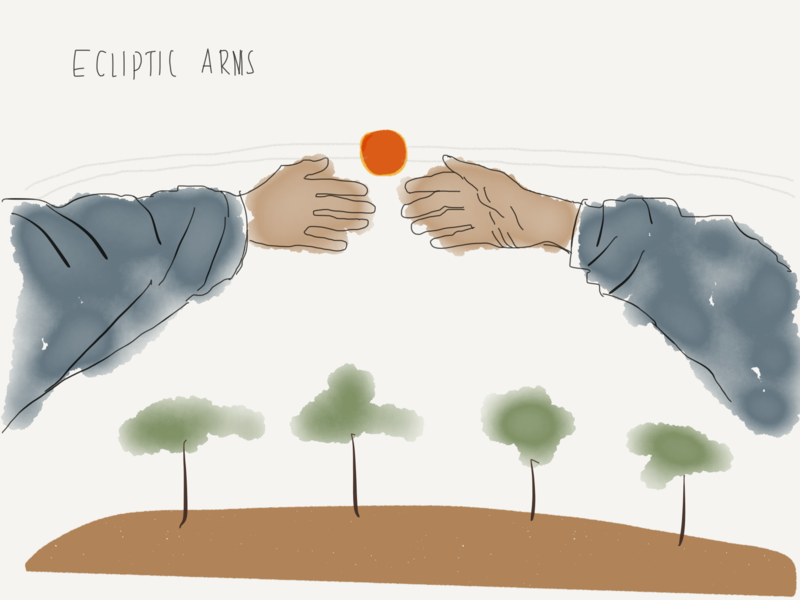 From your left elbow through your hands to your right elbow, your arms are tracing the path that the sun follows each day… the ecliptic. And it’s not just the Sun following the path of the ecliptic. All major solar system objects (the sun, the moon, and the planets and sometimes comets) seem to follow this path through the sky. So, now that you can “see” the ecliptic as a line across the sky we can talk about what it really is. It’s not exactly a path that sky objects follow… as you know, planets follow their own paths around the sun, their orbits. It’s a combination of their own path and our movements here on earth. Also, you might be asking why, if the sun is the center of the solar system, does it “move” at all? And also, why, if the moon is orbiting the earth, does it too follow the path of the ecliptic? All good questions. And there is a simple answer: the Earth rotates each day and makes it seem as if the sky objects are moving. This is worth repeating. It only appears that objects are moving. It is the earth moving and we are carried along on it. So, objects in the distance only seem to travel across the sky each day. Since the Earth rotation is stable and repeats, when we look up at the sky, the sky objects seem to move. There is one more thing that keeps all the solar system bodies “on” the ecliptic path. 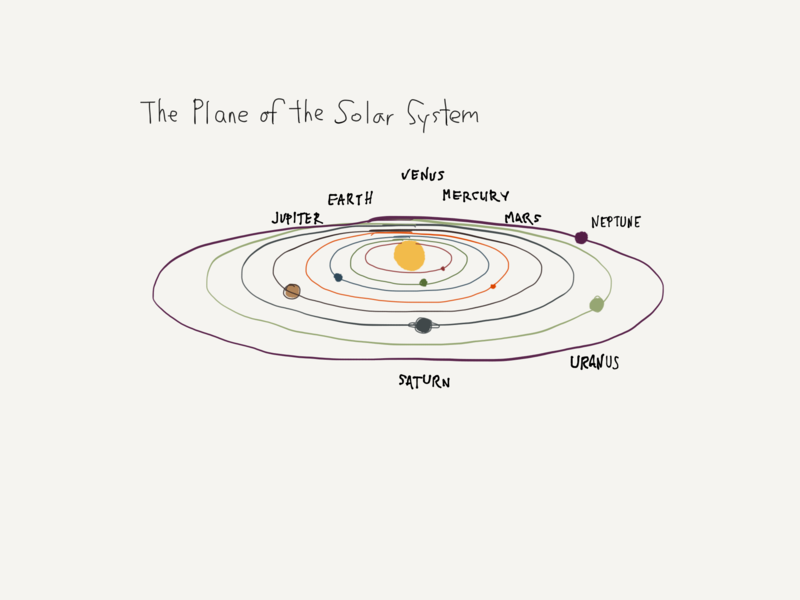 It has to do with the solar system disk. All solar system orbits are aligned with each other in their orbits – except for Pluto and the other planetoids like Eris and Ceres. The orbits look like a set of neatly nested concentric rings that lay flat like a plate. It is the combination of this flat plane of orbits and the daily movements of the earth that give rise to the ecliptic. The earth is orbiting yearly in this same flat plane orbit so our observing position changes over the year. However, the ecliptic stays the same. With this simple physical motion you can make the ecliptic visible any day. Put your arms around the ecliptic and discover one of the great physical astronomy sky patterns! Previous PostPrevious Quiz – Do you Moon Phase?